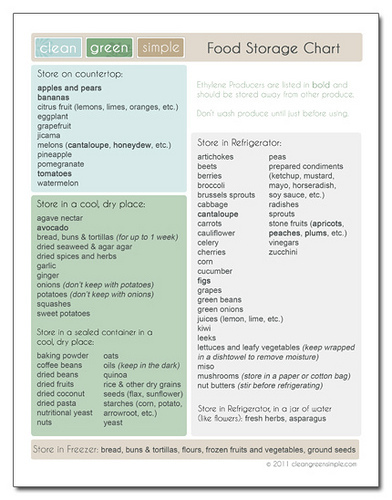 The best ways to store fruits, vegetables, and dry goods, with a printable reference chart! If you’re trying to eat a lot of fresh fruits and vegetables, or buying from the bulk bins, it is helpful to know how to store all that wonderful fresh food so it doesn’t go bad before you get a chance to eat it. I’ve had several people asking me where I store things like dried beans, flour, and various fresh fruits and vegetables, so I made up a handy little printable chart. You can download the letter-sized pdf here. 1. I tried to make the list as comprehensive as possible while still fitting on a single sheet of paper – if there’s anything important you think I’ve missed, please let me know and I’ll try to add it. 2. Some things can be stored several ways, as a matter of preference. For example, some people prefer to keep tomatoes in the fridge and some like them on the counter – I either went with what I do personally or what I felt was the most common method. 3. A general food storage rule of thumb is to think about where the food was in the grocery store when you bought it – was that avocado in the main part of the store or was it in the refrigerated part of the produce section? This doesn’t work one hundred percent of the time but it’s not a bad guideline for things you’re not sure about. 4. Stone fruits (peaches, plums, nectarines, etc.) should be ripened on the counter and then stored in the fridge once they are ripe. If you buy them mostly ripe you can just store them in the fridge right away (which is why they are listed in the “store in the refrigerator” section on the chart). 5. Bread, buns, tortillas and other baked goods can be stored in a cool dry place for about a week – if you won’t eat them within that time, you should keep them in the freezer, where they will last for a few months. (That’s why they are listed in both places on the chart). The fridge isn’t a great compromise because it makes bread go stale faster, but it can make it last a couple extra days in a pinch. 6. Lettuces and leafy greens are probably one of the trickiest things to keep fresh – as a general rule it’s best to only buy as many leafy greens as you can safely eat within 3-4 days. If you need to keep them for longer than that, wrapping them in a dishtowel (or paper towels, but you know how I like my reusable linens) and keeping them in the crisper drawer is the best way to make them last as long as possible. I’ll confess I’m usually too lazy for that step so I just keep them unwrapped in the crisper drawer and try to eat them within a couple of days. 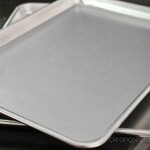 , they are usually pretty inexpensive and do a nice job for small batches. If you prefer to buy things pre-ground be aware that grinding grains, seeds, and nuts makes them go rancid faster (which is why I store flours in the freezer) so try to buy these things in smaller quantities so you can go through them quickly. So if an item is listed as “store in a cool dry place” assume I’m referring to it in its whole, unground form – once you grind it you should use it within a couple days or store it in the freezer. , which I like, and these bags look like a nice cost-effective option too) so you don’t have to waste paper bags or leave your food in plastic. I hope this chart comes in handy to help you figure out how to store all your lovely healthy food! Thanks for this! I’ve never really thought about where I put stuff and why. I just tend to use whatever space I have, so it’s good to have this for reference, to make sure I don’t mix something up. 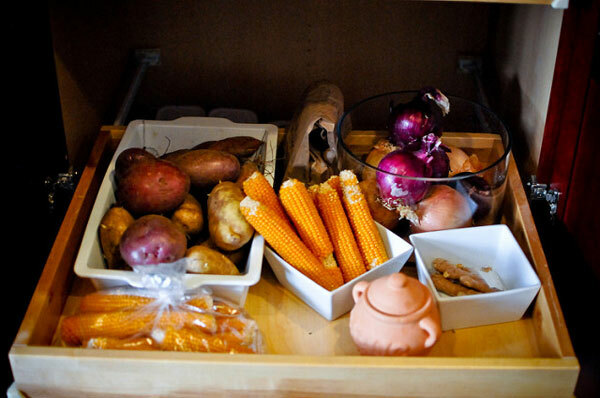 One question: Why should I not store potatoes and onions together? Right now I do, and I have noticed a musty odor in that cabinet, so I’ll be separating them to see if that helps (never thought of it before), but I’m still curious as to why that is. They say that if you keep potatoes and onions together they make each other sprout and spoil faster. There’s some debate about whether this is true or not, but in my experience they do seem to last a bit longer when stored apart (I keep them in the same cupboard, just in different containers so they aren’t physically touching). Thanks for the informative post! With only 2 people in our household, it is easy to buy more than we need and end up with waste. 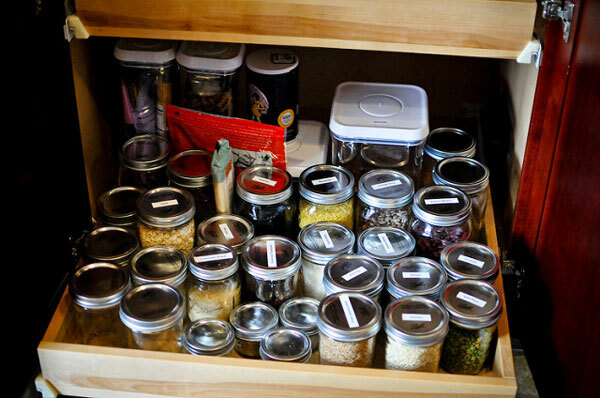 Storing foods properly will help me to reduce the amount of waste we have. 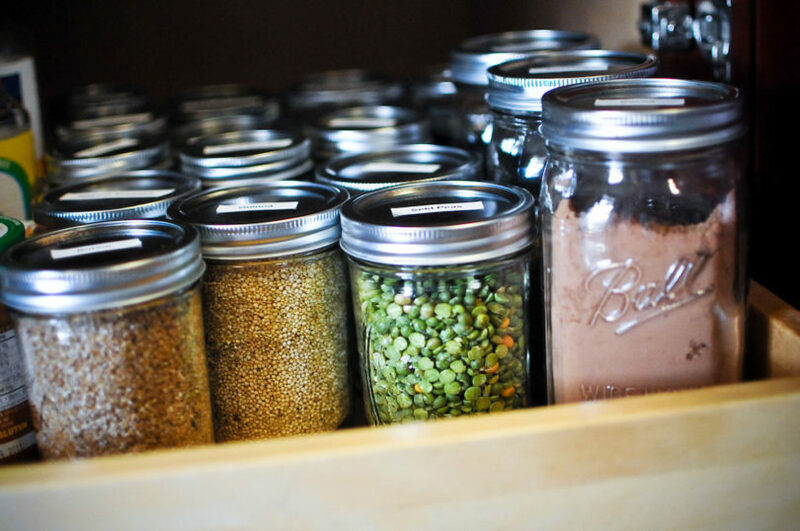 I love using mason jars for storage of grains, flours, beans and other dried goods! For avocados, I like to keep them on the counter until just ready to eat, then put them in the fridge so they don’t hit overripe before we’re able to eat them. Tomatoes, on the other hand, really do suffer from being refrigerated — they lose flavor and the texture becomes mealier. YMMV, of course. This is a really helpful list, thanks for putting it together! I hate it when I buy food and it goes bad before I have a chance to use it all. I love what you’ve put together here! 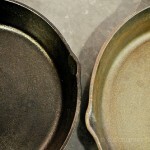 A practical and straightforward guide that encourages home-cooking with whole foods. And, as with everything on Clean Green Simple, its also beautifully designed. I’ve linked to both your blog and this pdf through my site and hope to send some hipsters your way! Excellent list! I can always use the help/advice! I have always frozen my bread,and recently had to throw away some figs and dates that i left in the pantry! Wont make that mistake again! Thank you!! This is so helpful, thanks!! It had no idea you could keep ginger out of the fridge- it doesn’t take up that much space, but it’s good to know. What a beautiful chart! Of course all the information is great too but I am very impressed with your style. I hope you’re in the graphic design world or somewhere where you can use the talent you have! This is so helpful – it’s going on my refrigerator door right now. Thanks! I can’t believe I forgot peppers! I love peppers. I’ll have to update that chart soon. Thanks for the nifty sheet ^_^ I printed it and posted it in my kitchen for quick reference! TIp: You can stock up on lettuce when on sale. If you wash and spin in salad spinner and put in canning jars in refrig, they can last up to 10 days.